Ms. Tchekovaya performed several songs from the repertoire of Dave Brubeck’s music with his wife Iola’s lyrics. The whole of her performance was dedicated to the 95th birthdays of Dave Brubeck and Carmen McRae. She started with “When I Was Young,” and included “In your Own Sweet Way” and other songs. Introducing “Blue “Rondo a la Turk,” she called it a ‘killer’ number. The tempo, expressiveness and drive were unprecedented. The audience was in rapture. Especially profoundly she performed the song “There Will Be No Tomorrow.” It was full of feeling and understanding. The musicians’ performance matched the passion of her singing. We found no video of Ms. Tchekovaya performing “Blue Rondo,” but Svetlana provided a link to an earlier version of “In Your Own Sweet Way.” The rhythm section is Victor Friedman, piano: Eugene Onishchenko, bass, Valery Dedov, drums. The alto saxophonist is Pavel Kutz. If that “killer” version of “Blue Rondo” materializes in video form, we will let you know. 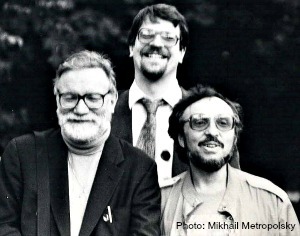 Addenum: Ms. Ilyicheva sent a photograph taken during Dave Brubeck’s 1988 Russian tour. It shows pianist Victor Friedman (right) with Chris Brubeck (center) and clarinetist Bill Smith. Friedman, who accompanied Victoria Tchekovaya in the video above, played for a couple of hours with Brubeck’s sidemen while Brubeck and President Ronald Reagan were received at the Kremlin. For a recent review of drummer Dan Brubeck’s performance of some of his parents’ repertoire, go here. Doug, thank you so much for this wonderful video; It is fitting in that the date of your post coincides with what would have been Dave’s 95th birthday. Dave Brubeck, a jazz legend gone but never forgotten. Thank you, and thanks especially to Svetlana for excellent work! The video is a first-rate performance by everyone involved. The work of The Real Ambassadors continues.